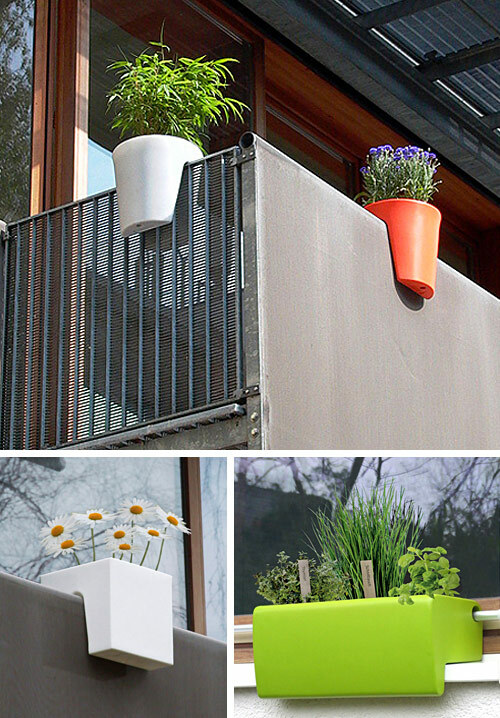 On my quest for ideas for my own possible balcony I found this smart planter. Aptly called ‘On the Edge’ and designed by German designer Michael Hilgers. It is a modern take on the traditional window planters. The pots are designed to hold themselves in place on the railing of a balcony, Made from water-resistant polyethylene, they can be left outside during all seasons. The pots can rest on any railing with a maximum thickness of 60mm, which is actually not too much, many wooden or concrete/brick railings will likely be too big. Two separate compartments offer multiple planting options. The crafty design is perfect for those city dwellers with limited outdoor space, but can easily be used in gardens, patio’s, roof terraces and even indoors. The can be bought online here. This entry was posted in Design, designers and online finds, General living and fun stuff and tagged balconies, design, plants. Bookmark the permalink.